You can't go wrong with a fun and safe hatchback like the 2019 Toyota Corolla. Hatchbacks are both practical and fun to drive which is why we’re always excited when we get new models to test. One of the greatest attributes of hatchbacks is their versatility. You get the performance of a sedan with the convenience of an SUV's cargo access. Versatile and fun are good starting points for choosing a vehicle, but they aren't the only features to look for. You should also consider whether or not a vehicle has earned a solid safety rating in crash tests. Though hatchbacks may not be as plentiful in the market as sedans and SUVs, we found 3 top safety-rated models that won’t bore you to death after you turn on the engine. Every year the Insurance Institute for Highway Safety (IIHS) crash tests vehicles to evaluate their safety in two categories: crashworthiness and crash avoidance and mitigation. Crashworthiness evaluates how well a vehicle will protect you in the event of a crash and crash avoidance and mitigation look at front crash prevention systems and vehicle headlights. To earn an IIHS Safety Pick rating, a vehicle must get 'good' ratings on driver-side small overlap front, moderate overlap front, side, roof strength, and head restraint tests. It must get an advanced or superior rating for front crash prevention and an 'acceptable' or 'good' headlight rating. In order to earn the highest IIHS Safety Pick+ rating, a car must get 'good' ratings in the driver-side small overlap front, moderate overlap front, side, roof strength, and head restraint tests, as well as an 'acceptable' or 'good' rating in the passenger-side small overlap front test. It also must earn an 'advanced' or 'superior' rating for front crash prevention and a 'good' headlight rating. We've tested out and reviewed a great batch of hatchbacks in 2018 with several models making the IIHS Top Safety Pick and Top Safety Pick+ list. We looked at the overall driving experience of the vehicles we've reviewed this past year and selected the hatchbacks that were both excellent to drive and scored the IIHS Top Safety Pick or Top Safety Pick+ rating. The following 3 emerged victorious among 2018 and 2019 hatchback models. The 2018 Kia Rio is one of the best small vehicles that we've tested this year. The 2018 Kia Rio EX 5-Door is exponentially improved with its latest redesign. Although it's not the most powerful hatchback out there with a 1.6-liter 4-cylinder engine, the Rio's capable steering, ride quality, and acceleration more than make up for its yawn-inducing 130 horsepower. The 2018 Kia Rio scored a Top Safety Pick+ rating with 'good' scores in all crashworthiness categories besides the passenger-side small overlap front for which it earned an 'acceptable'. In the crash avoidance and mitigation categories, the Kia Rio earned a 'superior' rating for front crash prevention and 'good' for headlights. 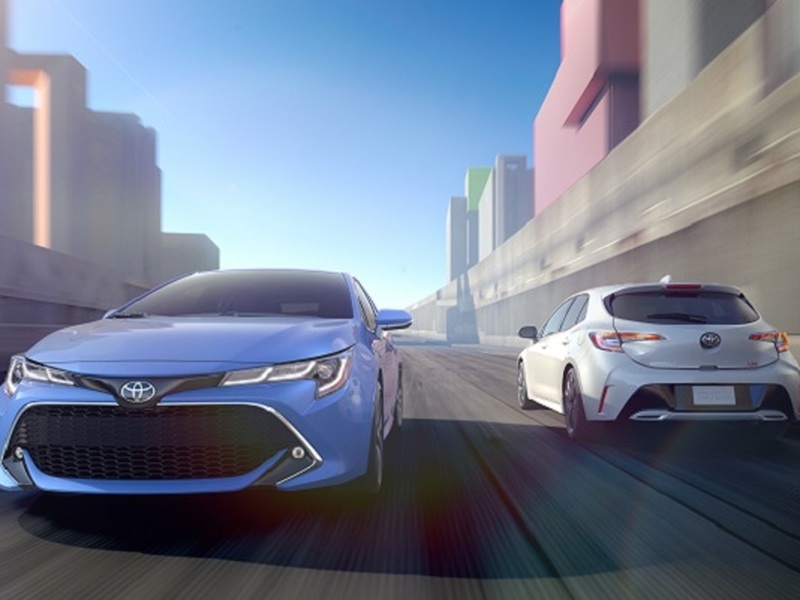 Considering our less than enthusiastic impression of the 2018 Toyota Corolla sedan, Toyota seems to have pulled off a miracle with its new 2019 Corolla Hatchback. We drove the 2019 Toyota Corolla Hatchback XSE and found the all-new model to be a breath of fresh air. The ride quality is firm but no bumps felt too harsh on our test drive. The 2.0-liter four-cylinder engine produces 168 horsepower beating the outgoing Corolla iM by a substantial 31 horses. To top off our rave review of the Corolla Hatchback's driving experience, we found the electrically assisted power steering to be exceptionally precise and sharp. The 2019 Toyota Corolla hatchback may be a brand new model, but the IIHS has already crash tested and evaluated this vehicle, issuing a confidence-boosting 2018 Top Safety Pick rating. The Corolla aced the crashworthiness category tests, earning the highest 'good' ratings for every metric. On the crash avoidance and mitigation tests, the Corolla Hatchback gets a 'superior' grade for front crash prevention and an 'acceptable' grade for headlights. The smallest member of Mazda's lineup is anything but short on driving fun. In fact, the 2018 Mazda Mazda3 5-Door Grand Touring earns one of the highest scores we've issued for driving experience, barely missing a perfect 10/10. The capable 2.5-liter 4-cylinder engine offering up 184 horsepower is partially to thank. Additionally, the Mazda3 hatch's steering gives plenty of feedback and handling is well-balanced which makes going around curves a breeze. The cherry on top of the enjoyable driving experience is the fact that owning a 2018 Mazda3 Hatchback means you'll be well protected in a crash. The Mazda3 earns a IIHS 2018 Top Safety Pick rating thanks to 'good' scores for all the crashworthiness categories, a 'superior' front crash prevention score, and 'acceptable' headlights.